For the last 5 days the picture shown above has been shared far and wide on Twitter (link to the tweet), and to a certain extent on Facebook too. 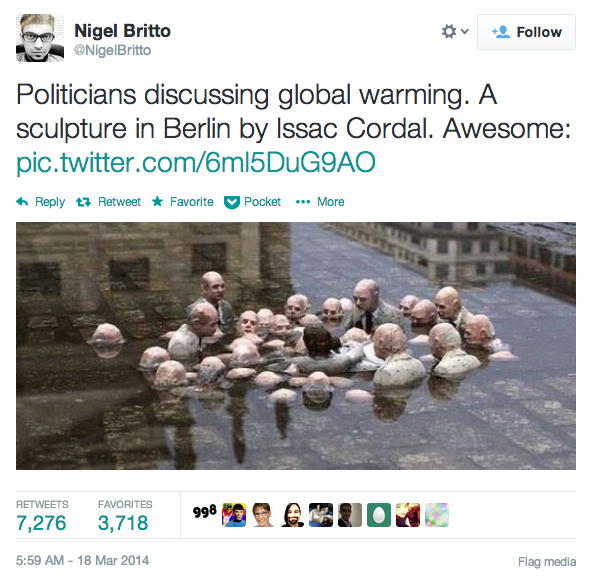 The title “Politicians discussing global warming” and the stunning picture match perfectly. I too was one of the people who retweeted the tweet a few days ago. Then I thought “Ooh, it’s in Berlin, let’s find it!” But Googling it just found websites talking about the tweet. It prompted me to wonder whether the picture was indeed real, and some debate among friends of mine – including some Berlin residents – on Facebook ensued. Determined to get to the bottom of it, I downloaded the picture, and ran it through “Search by image” on Google’s image search. Hey presto, the original picture – from the artist Isaac Cordal’s photo stream on Flickr. But with one important difference – the original is entitled “electoral campaign”, and while it was in Berlin it was from 2011! You will not find it today on Gendarmenmarkt as far as I know. The interesting conclusion here is that the picture, with the title “Politicians discussing global warming” as tweeted above, is immensely more powerful than entitled “electoral campaign”, and that is the reason for its reach now as far as I can tell. I wonder whether it was Nigel Britto who first applied that title? Anyway, it’s an interesting little case! Global Policy, and why does technology always let me down? Thanks for letting me know the sculpture is no longer there. I wish folks would cite sources/provide a bit more info when they post images!